Healthy eating is tricky, not just because some foods that are less than healthy are appealing, but also because the media and food companies often portray foods as healthy that are anything but. With labels like “low fat”, “1/3 the calories”, “organic”, and so on, it’s easy for a person to create grocery lists for weight loss and fill their shopping carts with foods they believe are doing their diet favors but in all reality, they’d be doing their dieting efforts and health a great favor by all together steering clear of most things that even have an ingredients list. This healthy grocery list goes way beyond the scope of considering how many calories is in any one given item. We don’t want you to fill your grocery carts with low fat, low calorie "health foods", we want you to feed your bodies and your families real, delicious, nourishing food. 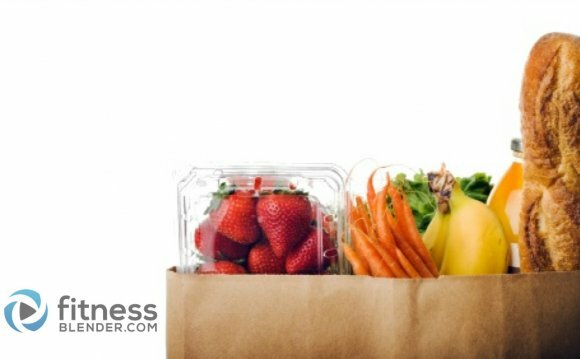 This grocery shopping guide focuses on foods that are high in nutrients and low in extra additives and fillers that were never meant to be consumed in the first place. Beans – black, pinto, kidney, navy, and/or garbonzo. These are easy to toss into the slow cooker or crock pot with a little salt and pepper; buy large bulk bags for the cheapest and lowest sodium options. • Plain yogurt – This can also be used as sour cream. Pick up some honey to sweeten it if you can’t stand the thought of eating plain yogurt. • Cheese – as little processed as possible; avoid cheese “products”, imitation cheeses, or anything that’s insanely low calorie as it’s probably nutritionally null and void, at best. • Whole wheat flour – try making your own bread and tortillas, if you can’t live without “toast”, bread sandwiches or traditional burritos and quesadillas. Any food or food product posing as a health food with a laundry list of ingredients that is loaded with sugars, artificial sugars, preservatives, sodium and more; always read both the nutrition information and the ingredients if you’re buying something that comes in a package. The usual suspects are: meal replacement shakes & meals/health/energy/protein/nutrition bars, veggie burgers, low fat or low calorie meals in the frozen section, cereals, canned soups, bread products, juices, “skinny” versions of things, etc. It’s all about moderation; eat well, most of the time. Healthy eating doesn’t have to taste strict or severe. There are a ton of wonderful recipes & meals that you can make out of the ingredients above. It also wont kill you to occasionally treat yourself to a dinner out, a bowl of ice cream, or pancakes slathered in syrup. Just aim to eat well the majority of the time.